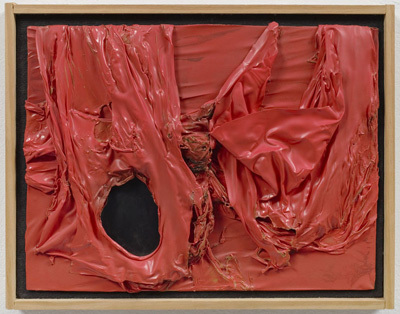 Rosso Plastica LA, 1966, plastic, acrylic, and Celotex, 11 3/8 x 14 1/2". Bringing together nineteen paintings, this exhibition is a rare occasion to see many of Alberto Burri’s masterpieces, and it charts a course from his early work, at the beginning of the 1950s, to that from a few years before his death, in 1995. When they were first shown, Burri’s “cut” compositions, which are covered with slashes as though they are wounded bodies, were read as references to the scars left behind by World War II. However, in their raw bareness, and in Burri’s exceptional talent for breathing new life into discarded materials, his works—like those whose burlap or plastic surface he cauterizes, effecting alchemical transformations in which industrial matter, marked by traces of suffering, is made to seem organic—are also understood as forerunners of many of the strategies that flourished in the 1960s under the rubric arte povera. But Burri always seems to bring a sense of order to his materials, despite his expressionistic use of them. Rosso Plastica LA, 1966, looks like decorticated, savagely torn skin. On the gallery’s rear wall, two outstanding examples of “cracked” paintings—Cretto Grande Bianco, ca. 1982, and Nero Cretto, 1976—seal the show with their placid stillness and epitomize Burri’s philosophy: Let the forces of nature corrode the materials, but always introduce a classical measure to keep things in place.